Filling cracks in your asphalt driveway or parking lot surface is a very important part of extending the life of the asphalt surface. 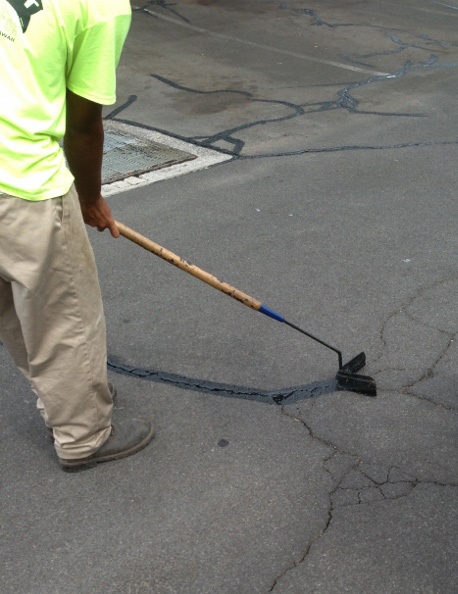 There are two important reasons to maintain and repair cracks in your asphalt. The first reason is to prevent moisture from penetrating under the asphalt surface, causing damage to the driveway or parking lot. Of course you should sealcoat your asphalt surface as well, for added protection and preventive maintenance. The second reason to fill the cracks in your asphalt is because vegetation will begin growing in them. As the roots of vegetation get bigger, the plant root can actually push the pavement up and create even more damage. Even worse, if water does penetrate the crack and seep under the asphalt surface, this will almost always create a soft spot which, in turn, can create a pothole or depression.